Extremely hard-wearing, flexible vinyl mats. Excellent drainage for water and dirt. Tapered edges avoids trips and allows easy wheeled access. Flame retardant to DIN 4102. Also suitable for indoor use. Thickness: 12mm.Hole size 22 x 10mm. Finding the right matting for your premises is important, you need to know it is going to do the job and not be a hazard to the people using it. Our outdoor entrance matting is heavy duty, but flexible, and works to help remove dirt off footwear at your doorstep. They provide excellent drainage for water and dirt, and they are extremely hard-wearing, flexible vinyl mats. The ribbed surface contributes to good dirt removal while providing slip resistance to prevent accidents from occurring in wetter conditions. For extra safety the edges are tapered, helping to avoid the matting becoming a trip hazard, and it also provides easy wheeled access. 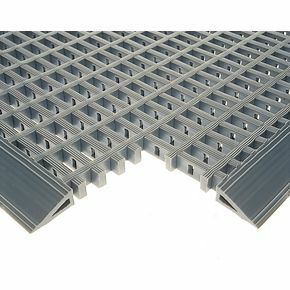 These versatile mats are suitable for indoor use as well as outdoor and they are flame retardant to DIN 4102. They are available in three colours; black, brown or grey. There is also a choice of three widths; 600, 1000 or 1200mm and three lengths; 1200, 1500 or 1800mm. Our outdoor entrance matting offers an effective way to keep your workplace floors from getting dirty, while keeping users safe. They come with a 12 month guarantee and FREE UK Delivery.